Where do I begin to tell you about the journey that my Angel, Vickie, took us on. February of 2012, she had a sore hip, so we had x-rays done, then a scan, followed by a biopsy. We were called in and for the first time in our lives, we heard of what we were going to be fighting, Advance High Grade Metastatic Leiomyosarcoma, better called LMS. We had never heard of it, and we soon found out that most of everyone else, including a lot of medical personnel hadn’t either. Now what do we do? We were then referred to a local oncologist ad that turned out to be the answer we needed. He had the phone number for Dr. Sant Chawla, a specialist in sarcomas. Problem one, he was in Santa Monica and we were in Palm Springs. To make a long story short, we began the battle and trips to Santa Monica to be on the clinical trial run by Dr. Chawla and staff. In April of 2012, we started on the first of several trials. This is where we found out about the most amazing help we would receive in the battle. Dr. Chawla’s office staff told us about an organization that could help make things easier on us by helping with the lodging and gas, that savior was the Lazarex Cancer Foundation. Without this support, the next nineteen months would not have been possible. Our trips would range from twice a week to once a month, depending upon the trials and setbacks we would incur. 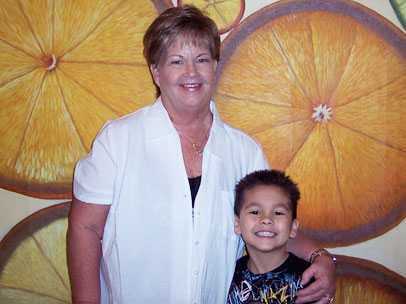 Through all of this, my Angel would be able to vacation with her son and wife and two lovely grandkids several times. Lucky for us, her daughter and husband and the other grandson lived here in the desert. Being close has given great comfort to the families. In the beginning of this journey, we were told we had only three months, due to the advance stage of this monster, LMS. You just never know what life has in store for you. Vickie fought this battle and lived her life doing what she did best; loving and caring for all that she came in contact with. We have a neighbor who put it best for me and the family when he told me, “the world would be a much nicer place if we had more like her”, and we agree. Dr. Chawla always said that she was his poster-child and would make him famous; no words can describe this unbelievable caring gentleman, Thank You Dr. Chawla and staff! The journey came to an end this past November, the day after Thanksgiving 2013, almost two years after being told of this new ugly word that would reshape our lives as we knew it. Without the loving and caring staff of Dr. Chawla’s office and the help of the Lazarex Cancer Foundation, this journey wouldn’t have gone this far. They provided the comfort needed by all of us. Vickie and I came together some sixteen years ago, we married along the way and we very rarely were ever apart. So now, I go forward in life’s journey without my loving Angel. This has been hard to pen since I always had my other, better-half’s help. Our loving Angel is now resting and looking over our native San Diego Bay. Our prayers for all we came in contact with during this journey and we’ll never quit loving them all. My love and blessings to all who helped us.